The Archaeological Site of Ani is a ruined medieval settlement that was a commercial center on the Silk Road and other trade routes into Anatolia. Its heyday was in the 10th-11th century, when it became the capital of the Bagratid Armenian kingdom that covered much of present-day Armenia and eastern Turkey. At the time it was also the seat of the katholikos of the Armenian Church, resulting in fine examples of Armenian religious architecture and the nickname ‘City of 1001 Churches’. All the structures at Ani are constructed using the local volcanic basalt, a sort of tufa stone which is easily carved. Notable remaining buildings include the Cathedral, the church of St Gregory of Tigran Honents, the citadel and the mosque of Manuchihr. The nominated area also includes the rock-cut dwellings and monuments outside the city walls. Considering the history between Turkey and Armenia, this is a controversial nomination. I won’t go into detail here about the current Turkish political scene and its complicated opinions on what happened in 1915. But behind the scenes the acceptance of Ani as an important part of the heritage of this region has been in the making for almost 20 years. The site finally entered Turkey’s Tentative List in 2012. I visited Ani way back in 1992, during a 3-week-long group tour that took us all over Turkey by bus. I don’t remember much about Ani, only the remoteness (and excoticness!) of whole eastern Turkey is a clear memory. 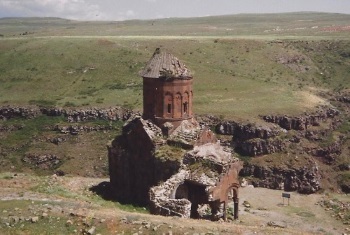 Ani itself for me is symbolized by that one ruined church (see first photo) and the deep gorge next to it that divides the two countries. Since then quite a lot seems to have changed. While looking for additional photos to accompany this post I noticed all kinds of buildings that I do not remember from 1992, some including interior murals. The website Virtual Ani covers all of them. Recent visitors confirm that it stil is an off-the-beaten-track destination though. Minor Sights describes his visit from 2012 as a lonely experience and helpfully suggests "Don't mention the war!" A Tripadvisor report from June 2015 hints at the very vast size of the site, the need to bring plenty of drinking water and the entrance fee of 8 Turkish Lira. I had been fascinated by Ani for a long time, even before it was included on the WHS List. While travelling in Armenia the previous year, I had a far-away view of the site, from across the border, with no possibility to visit, the Armenian-Turrish border still being seald-off. I therefore decided to make a trip only to visit Ani in october 2018. Luckily, domestic flight from Istanbul are convenient and rather cheap. There are several daily flights to Kars (50 minutes from Ani), but I chose to get through Van (some 4 hours away) to also enjoy the area’s TL sites (3 around Van lake and one on the way, next to Dogubayazit). Renting a car is quite easy, but don’t expect anyone to speak english in any rental agency, or at police check-points (the area is close to Iran and Armenia borders). However, they all have Google translation on their mobile phone. Ani is a triangular plateau formed of three valleys. It has been settled since Early Iron Age (BC 1200-1100), and slowly reached its heydays in the Mediaval time. It became the capital of Armenia in 917, and then of the Katholicos (religious seat) in 992. The location of the city on the Silk Road helped a rapid growth, which seemd to have reached 100 000 habitants around 1000. It was then called « the city of thousand and one churches ». It lost it capital status after invasions in 1045 but remained a cosmopolitan trade center where diverse communities lived together and numerous religious monuments were built. 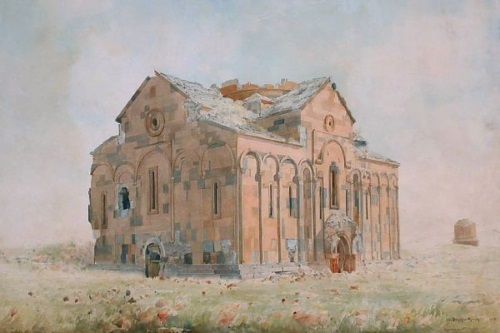 The city was abandonned sometime at the end of the 13 th century (due to Mongol invasion, transfer of the Katholikos to Yerevan or destoyed by earthquake, depending on the source). With a rental car, Ani is very easy to reach, at the end of a well maintained and well signposted road 45 minutes from Kars. There is a bus everyday from Kars leaving two hours to visit the site. On the site, the first thing we see is the impressive double line of fortifiction. A 10 lira entrance fee is asked as you pass through those fortification. And then lies the triangular plateau where the city once stood, a bare meadow dotted with numerous stones, and a few buildings. They are all made of local volcanic reddish basalt, which give then peculiar appearance and are all in very different state of conservation. There is the central cathedral, numerous chapels and churches spred around the site, a mosque built in 1031, the foundation of a Zoroastrian fire Temple, the citadel high on a hill, the ruins of a Silk Road bridge over the river, and a spectacular fortress at the bottom the hill, near the merger of the valleys. 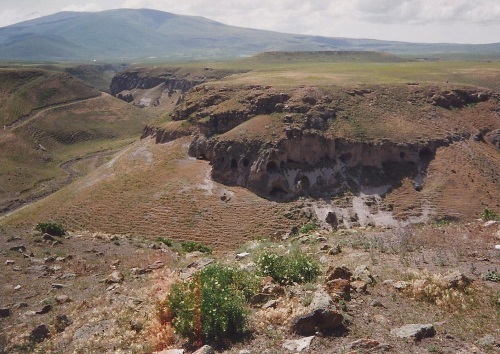 On the slope of one of the adjacent valley, visible from Ani, is a rock-caved village. 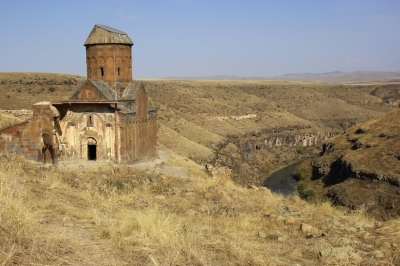 My favorite building is the church of St Gregory of Tigrant Honents (see picture), one of the best preserved monument (built in 1215), overlooking the deepest valley, with very nice view on the river gorge and across the Armenian border, and with spectacular wall paintings. Allow at least two hours, or better three hours to take full advantage of the site. One of he main feature of this site is its vastness and emptiness. Being far away from touristic roads and closed to visitors from Armenia, very few people get to visit this place. There way probably 6 or 7 tourists while I visited, lost in the 85 hectars of the plateau. Building can almost all be entered, and only the furtherst fortress seem to be off limit. On T List as "Historic City of Ani"